Was Upper East Side (like in a Warren Zevon song) in Manhattan on Sunday 16 September 2012 and captured a couple recordings at Bloomingdale’s. I flipped a coin to decide which to submit to the Junto and this one lost, but it was worth sharing. This recording was made on the 8th (top) floor in the children’s section. The sounds involved a back-to-school mannequin display designed as a fake rock band called “The Know-It-Alls,” complete with guitars and drums that kids played as they passed by. The display was in front of the main elevators and an employee-only set of double-doors. Kids and parents alike alit from the elevator and hit the drums and strummed the guitars as they passed by. Recorded while walking and holding iPhone in hand. Faded the edges off the audio file in Acid. Was Upper East Side (like in a Warren Zevon song) in Manhattan on Sunday 16 September 2012 and captured a couple recordings at Bloomingdale’s. I flipped a coin to decide which to submit to the Junto and this one won. This recording captures a journey from the 59th Street N/R/4/5/6 subway station under the store to the street. There is a proprietary entrance to the store from the station into the basement-level “Metro59” section of the Men’s Department. Once inside, you can zig-zag up a couple 1/2 flight escalators, then up and down some stairs to arrive at the main street entrance on Lexington Avenue between 59th and 60th Streets. Off-the-cuff sight read. Kinda fun to record. Set the controls for the heart of the sun. Guitar rig: Jolie (cherry-red ES-335, customized by Peekamoose Guitars, www.peekamoose.com), Vox AC-15, Ibanez Screamer, Line-6 Pod-XT Flange/Wah/Phaser. The project this week is to perform a rendition of a piece of sheet music. 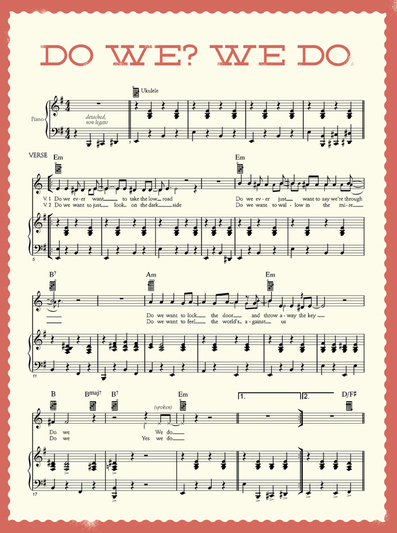 The sheet music in question is a single low-resolution image from the forthcoming “sheet-music album” to be released by Beck this December. The image was provided by the publisher McSweeney’s when it announced the Beck collection, which is titled Song Reader. You can use whatever instrumentation you like. Feel free to interpret the sheet music as literally or abstractly as you choose. More on Beck’s Song Reader. More on this 35th Disquiet Junto project. More details on the Disquiet Junto.